Domestic cats do not generally see their owners as a focus of safety and security in the same way that dogs do, according to new research. 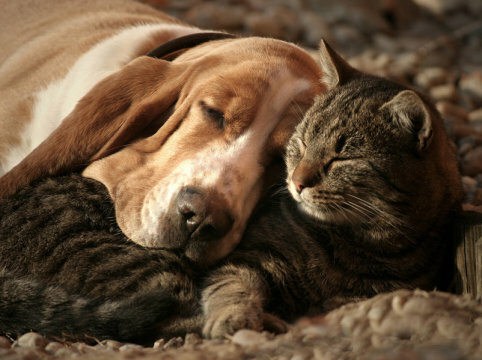 Relaxed cat and dog. While it is increasingly recognized that cats are more social and more capable of shared relationships than traditionally thought, this latest research shows that adult cats appear to be more autonomous — even in their social relationships — and not necessarily dependent on others to provide a sense of protection. The study by animal behaviour specialists at the University of Lincoln, UK, shows that while dogs perceive their owners as a safe base, the relationship between people and their feline friends appears to be quite different. While it is increasingly recognised that cats are more social and more capable of shared relationships than traditionally thought, this latest research shows that adult cats appear to be more autonomous – even in their social relationships – and not necessarily dependent on others to provide a sense of protection. The research, published in the scientific journal PLOS ONE, was led by Professor Daniel Mills, Professor of Veterinary Behavioural Medicine at the University of Lincoln’s School of Life Sciences, along with Alice Potter – who studied as a postgraduate at Lincoln and now works with the Companion Animals Science Group at the RSPCA. The Lincoln researchers carefully adapted the Ainsworth Strange Situation Test (SST), which has been widely used to demonstrate that the bond between young children or pet dogs with their primary carer can be categorised as a ‘secure attachment’ – where the carer is seen as a focus of safety and security in potentially threatening (or unfamiliar) environments. The study observed the relationships between a number of cats and their owners, placing the pets in an unfamiliar environment together with their owner, with a stranger and also on their own. In varying scenarios, it assessed three different characteristics of attachment; the amount of contact sought by the cat, the level of passive behaviour, and signs of distress caused by the absence of the owner.